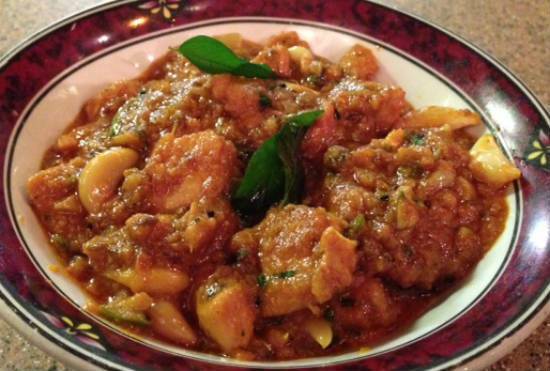 A popular chicken dish best served with rice or roti. 1. Combine all the marinade ingredients in a large bowl. 3. Cover with a lid and keep it in the fridge for 3 to 5 hours or overnight. 4. Heat oil and butter in a pan over medium flame. 6. Add the green chillies and ginger garlic paste. 8. Add the cumin seeds, cloves, black cardamoms and cinnamon. 10. Add the tomatoes, salt, turmeric powder and red chilli powder. 11. Cook for 5 to 10 minutes. 12. Add the chicken (with the marinade) and stir well. 15. Remove after a minute. Tip: If preferred, you can also add 1/4 cup of chopped capsicums. Feel free to comment or share your thoughts on this Chilli Garlic Chicken Recipe from Awesome Cuisine.